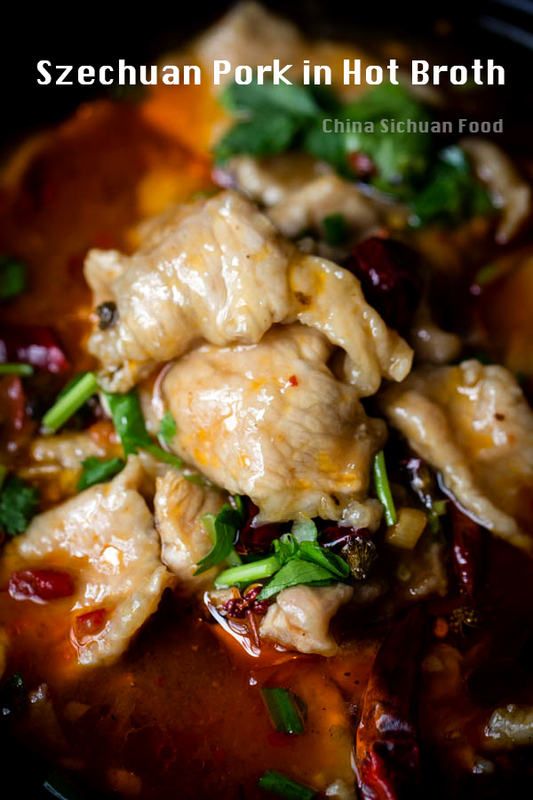 Infamous Szechuan pork in Chili Broth but an outstanding Shui Zhu dish you should never miss. 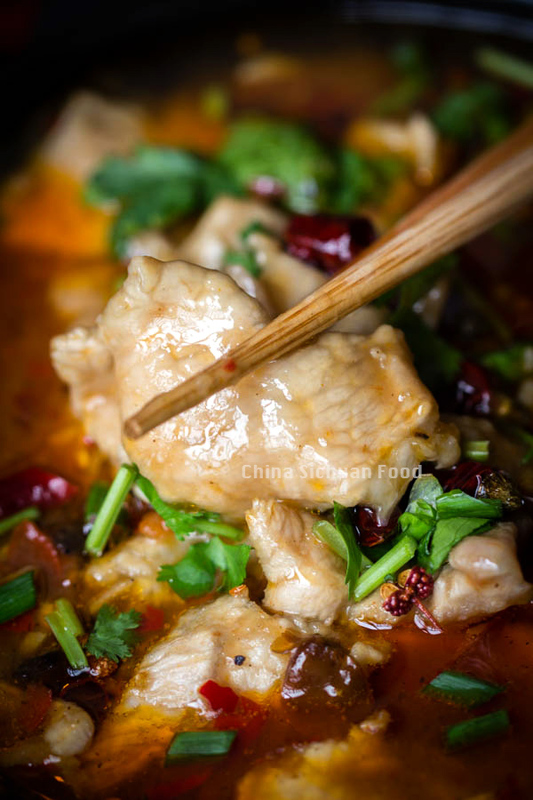 Like most of the Szechuan dishes, it is simple as long as the ingredients are well prepared. Firstly some background information of this famous Shui Zhu series. 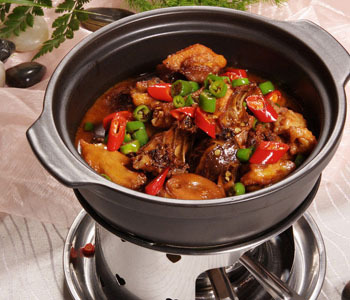 Shui Zhu, literally translated as water boiled, is a special item referring to a cooking method popular in Sichuan Cuisine. 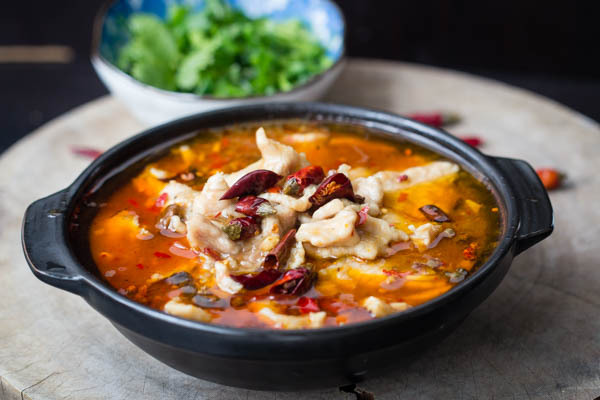 There are two unique features of this cooking method: the first one is the famous seasoning like doubanjiang, Sichuan pepper, Sichuan dried chili pepper (which usually presents a bright red color but less spicy taste) and green onion, ginger and garlic cloves. The second one is the very last step—pouring hot oil over the dish, which can extremely keep the aroma inside the meat and vegetable. 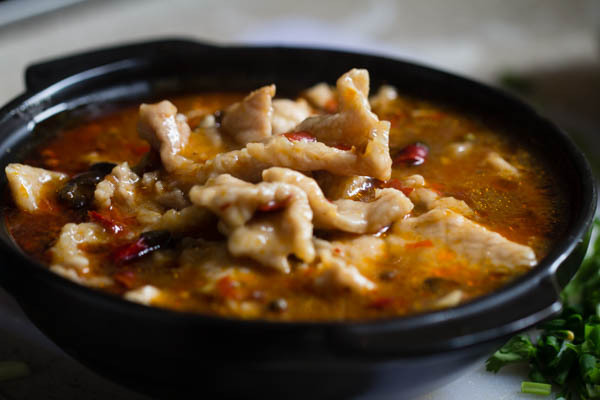 However usually Shui Zhu dishes are home-friendly dishes. 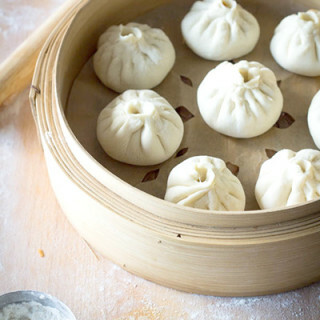 You can easily make restaurant style at home or even better! Vegetables are firstly placed at the bottom of the serving bowl. 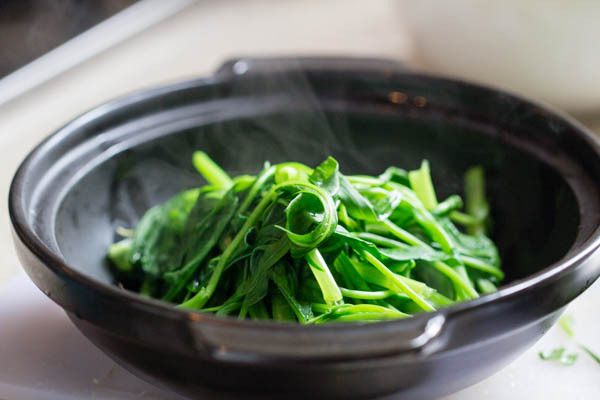 Cabbage, Napa cabbage, bean sprouts and Chinese water spinach are usually used. Pick your favorite or combine several together. I am using water spinach, as it is freshly available in the market now. 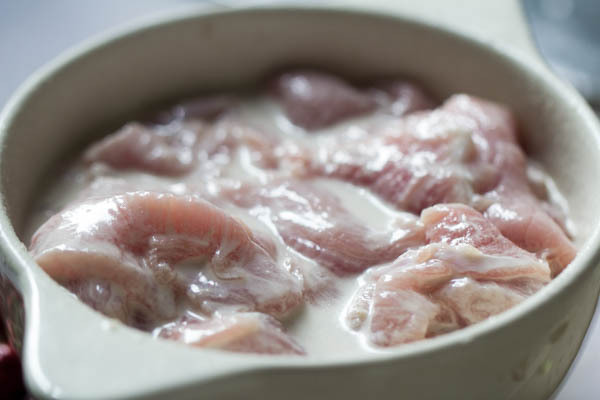 In order to keep the pork as tender as possible, there are two tips– firstly, the slices should be evenly coated with starch, which will create a smooth surface and prevent the pork to be overcooked; Secondly, limit the cooking time after the broth boils again to less than 30 seconds. As you can see from the following picture, there are transparent layers outside the slices. 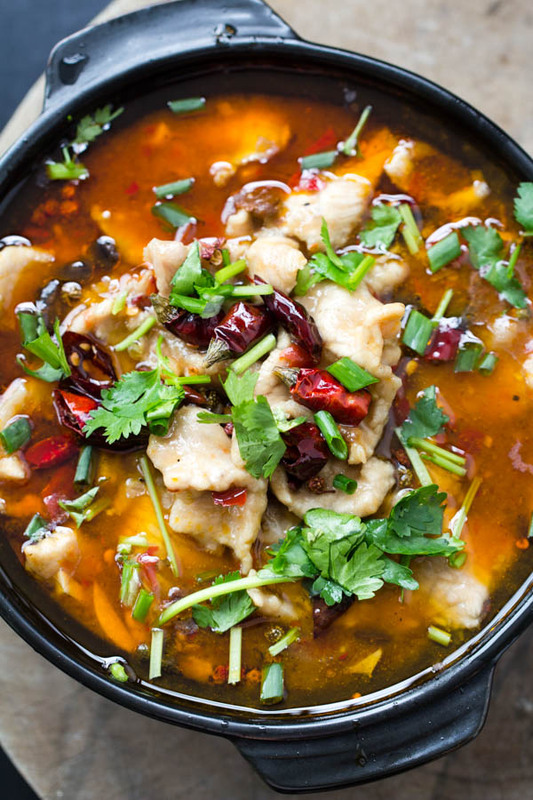 If you love Shui Zhu dishes, check Shui Zhu Fish too. Slice the pork thinly and then add pinch of salt, starch, cooking wine and water. Combine well and set aside for 10 minutes. The pork slices should be well coated with the starch. This is to guarantee the thin outside layer protecting the pork overcooked. Pour around 1L water in. Simmer for around 15-20 minutes with lid covered. During this process, you may smell the strong aroma bought by the broth. During the process, in another pot, cook water spinach for around 30 seconds in boiling water (with pinch of salt and several drops of oil). Transfer out and lay in the bottom of the serving bowl. Grasp the pork again to make sure they are evenly coated. Turn up fire and add the pork slices in and cook until the broth begin to boil again. Wait for around 20 to 30 seconds and transfer them out immediately. 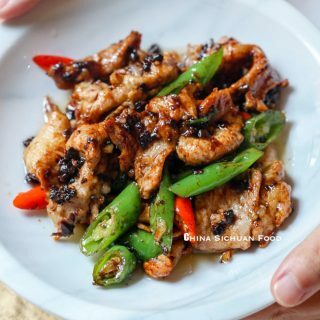 Heat up around 2 tablespoons of cooking oil again in wok with the left chili pepper and Sichuan pepper over slow fire until really hot (you can smell the strong aroma and the chili pepper begins to turn dark). 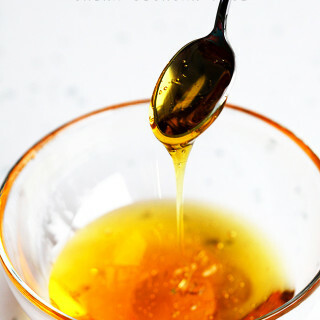 Evenly pour the oil on the surface of the serving bowl. Be careful during the process; do not get burnt! Serve directly or garnish with green onion and coriander. The dish needs to be served immediately as the left heat inside will continuing heating the slices. But watch out your mouth. Take one piece out and cool down for several seconds before enjoying. This looks mice. I love everything Sichuan style. The chicken looks so tender in the spicy sauce. Yum! It is neither mice nor chicken: it is PORK. By the way, I would like to ask you what recipe plugin you use to insert the pictorial instructions on the recipe? I noticed that the pictures don’t show when I click to print. I really like the feature. I am using a recipe plugin named as Ziplist. It should be available on wordpress. And you can check to hide the images when printing. Thanks! I actually used that plugin before but I didn’t realize that I could add the images. LOL! Great recipe! 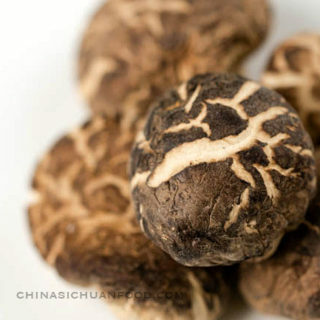 My wife is Chinese, although from Fujian rather than Sichuan, but she absolutely loved this. Will make again. Hay, thanks for your lovely feedback and I am so glad to know that your wife love it. You are such a caring husband!!! Enjoy happy time with your family. Yes beef slices should be perfect ingredient for Shui Zhu dishes too. 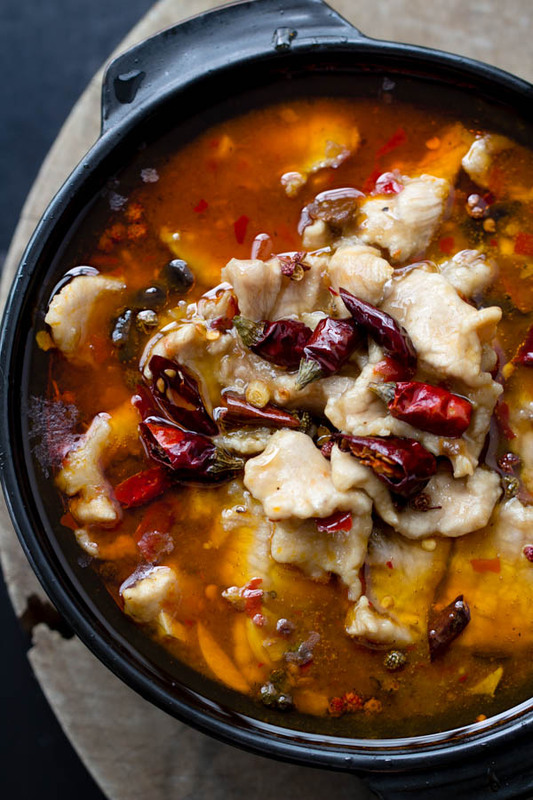 Szechuan food is really great in winter, right? I love your blog! 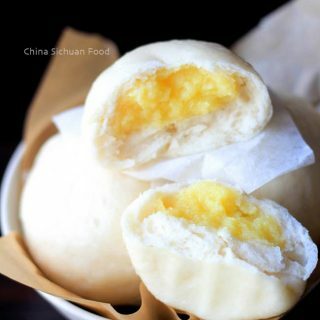 You have captured so many of my favorite dishes. I made this dish last night and it was delicious! One question though, in step 6 when you say “grasp the pork” was I supposed to drop the slices of pork in one at a time or just pour the pork mixture in all at once with all the liquid starch mixture? Thanks! Sorry for the misunderstanding! You need pour the pork into the mixture in all at once and then combine well. 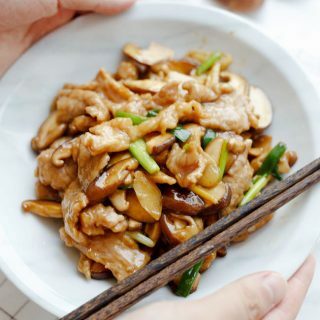 “Grasp the pork” can help to massage the pork slices to help adsorbing the mixture and combine mixing the mixture as even as possible. I flipped when I first had this in a chinese restaurant, in Vienna of all places! Yes, we have to travel 1000 km to get good chinese restaurants… now I do it at home, not too often, because I have the impression that the oil goes straight into my hips after 2 weeks. Be careful! But the oil trick is so fantastic, I often make it just with noodles, chicken broth, some green and chopped beef or pork. A good trick would also be to buy just any meat and chopping it with a hammer, this allows for short cooking time and the flavors go into the meat very well. Of course not a thing your butcher would recommend – they say it destroys the meat’s structure. Well, this is just the point, isn’t it? Is this correct ? Seems rather long time to boil. Thanks for the correctness. It should be less than 30 seconds. 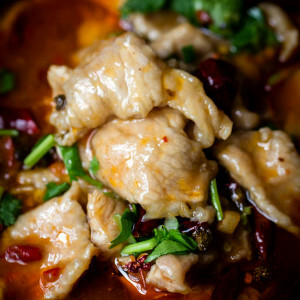 I really liked the Shui Zhu Beef and have yesterday tried this recipe with pork. It’s just amazing. Thank you so much! By the way, it is my impression, that sweet potato starch needs a lot more water than regular potato starch.